How much can the world's climate change before we face complete disaster? 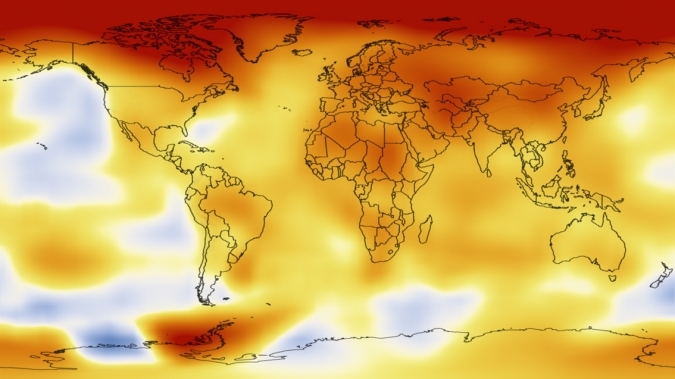 It has been suggested in the past that 2 degrees should be our target limit but at a meeting of the American Geophysical Union this week James E. Hansen of NASA's Goddard Institute for Space Studies warned that using this limit would be a big mistake. Paleoclimatology is the study of the climate over the lifespan of the planet. Using evidence garnered from samples of glacial cores and deep sea sediment, paleoclimatologists can find patterns in the natural changes of the past and use them to predict future changes. Hansen looked at the environment found in the interglacial period known as the Eemian period. Lasting approximately 15,000 years and starting 130,000 years ago, this period was slightly warmer than the global temperature found today. The difference was less than a degree but sea levels were about 5 metres higher than now, with this water currently held in the polar glaciers. If global temperatures increase by two degrees then the closest period for comparison would be Pliocene, a time when sea levels were an incredible 25 meters higher. A change of this magnitude would wipe hundreds of cities off the map and countries such as the Netherlands would also have uncertain futures. The work produced by the Goddard Institute suggests that a change of 1 degree could result in a sea level increase of 20 metres. Hansen described the two degree limit as, "... a recipe for disaster." An important issue raised is that we must be careful not to forget that the loss of polar ice is not linear. As the climate changes the rate of glacial destruction is compounded. It is predicted that by 2100 the world will have to deal with a sea level increase of several metres if current trends continue. Although this field is important for the understanding of our climatic future, the researchers admit that human interaction adds a complex variable into the equation. Paleoclimatologists are uncertain how our actions will alter the predicted outcomes formed from their research. One thing is clear, however: We will have some difficult times ahead of us if our past is anything to go by.